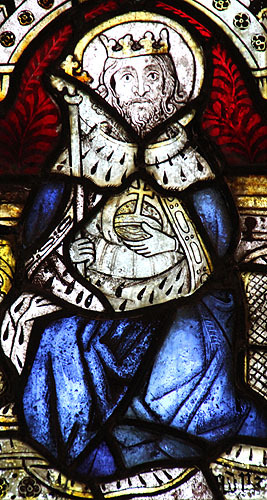 Cadwaladr the Blessed was the son of King Cadwallon of Gwynedd and his wife, Alcfrith, sister of King Penda of Mercia. He was only about a year old when his father died in AD 634. Civil War ensued and the baby's followers were forced to flee the kingdom with him, as the throne was seized by one Cadfael ap Cynfeddw, of unknown origin. Tradition says he was ill for much of his de jure reign, during which time the Civil War in Gwynedd continued on and off. This was not helped by a widespread famine, followed by a plague, that swept through the country at the same time. It is possible that Cadwaladr died of this plague in AD 664, although this was probably his nemesis, King Cadfael. A tradition, recorded by Geoffrey of Monmouth, has him fleeing to Brittany, where he accepted the hospitality of King Alain Hir (the Tall). Many years later (presumably after Cadfael's death), Cadwaladr sent his son, Ifwr, back to Britain to secure the Royal throne. We might assume that the King followed him soon afterward for he is said to have been the last monarch to have any semblance of authority over the other Celtic Kings of Britain. He was certainly a great patron of the Gwynedd church, particularly of Clynnog Fawr Abbey. In old age, he may have even become a monk at the Royal monastery of Eglwys Ael (Llangadwaladr) on Ynys Mon (Anglesey). Cadwaladr died while on a pilgrimage to Rome on 12th November AD 682. His body was brought back to Wales and buried in his church at Eglwys Ael which became named after him, as Llangadwaladr. He was succeeded in the throne of Gwynedd by his son, Idwal Iwrch, but he may have had two other children, Gwrgan and Hywel. Ifwr may well be mythical - or a misspelling of Idwal.